An astute, laugh-aloud funny, and thought-provoking novel from bestselling novelist Sophie Kinsella about the hidden layers that exist in even the closest relationships. After being together for ten years, Sylvie and Dan have a comfortable home, fulfilling jobs, beautiful twin girls, and communicate so seamlessly, they finish each other's sentences. They have a happy marriage and believe they know everything there is to know about each other. Until it's casually mentioned to them that they could be together for another sixty-eight years... and panic sets in. Gradually, the surprises turn to shocking discoveries. And when a scandal from the past is uncovered, they begin to wonder if they ever really knew each other after all. 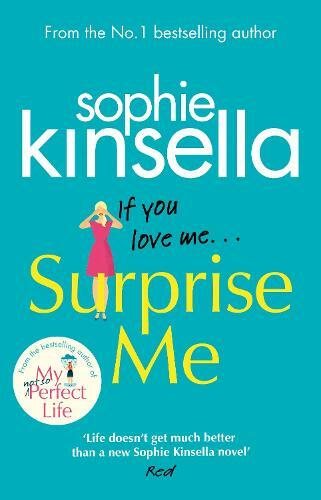 I love Sophie Kinsella books and this one certainly didn't disappoint. A funny and very entertaining read right from the very first page. A feel good read and a fantastic look at friendships and relationships. I work at Waterstones and was kindly sent a copy of the novel.